The gold in this area was transported in and deposited from fluids rich in CO2. The auriferous quartz formed from these pregnant fluids can be readily identified and distinguished from other barren quartz using the decrepitation method, which is a useful additional exploration tool in this region. The Arltunga goldfield is some 100 Km ENE of Alice Springs, NT, and was discovered in 1887, along with the nearby White Range gold deposits, some 5 Km away and the Winnecke deposits. 20 samples were collected from the Arltunga area from old mullock dumps, and 5 samples were obtained from the White range mine during its operation in 1985. Gold mineralisation occurs within quartz veins hosted by proterozoic gneisses and schists. The locations are shown here. Precise, individual sample location details are not available. NOTE: the following location map does not work if you are using ie 6 as your browser. If you only see a map of USA, use firefox >3 instead. It works. The green marker is Alice Springs town. The red marker is the Arltunga goldfield where 19 samples numbered 330964 to 330983 were collected. The Yellow marker is the White range mine area, from which 5 samples were analysed. The cyan marker is the Winnecke goldfield. No samples have been analysed from there. Click on the coloured pin icons for location details. These samples 330964 to 330983 were all collected from the old Arltunga workings area, within a radius of about 1 Km from the crossroads. Sample 330964 was of float from the old mill site and is probably spilled ore. 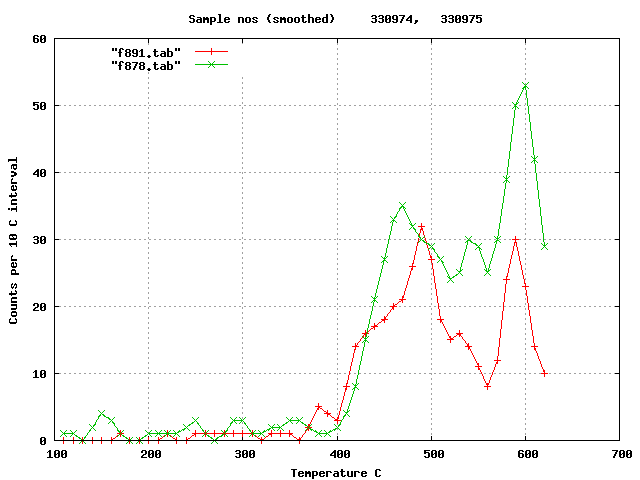 Note the substantial low temperature CO2 decrepitation peak. Samples 330965 - 330967 were from old workings pits beside the road. 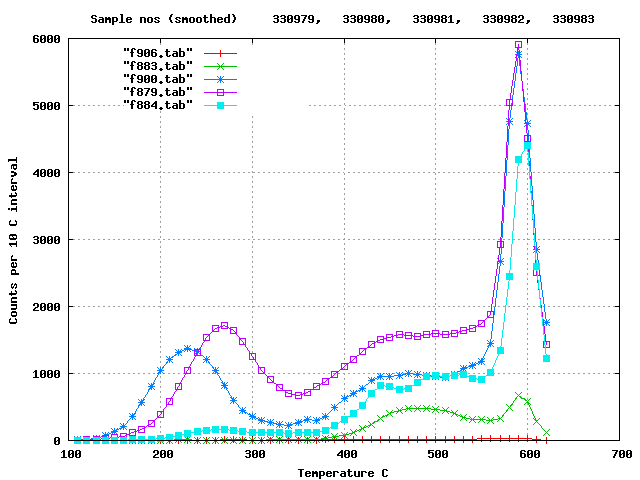 Again these samples have substantial low temperature decrepitation caused by CO2 rich fluids. Samples 330968-330970 were from old workings east of the road, on a small hill. 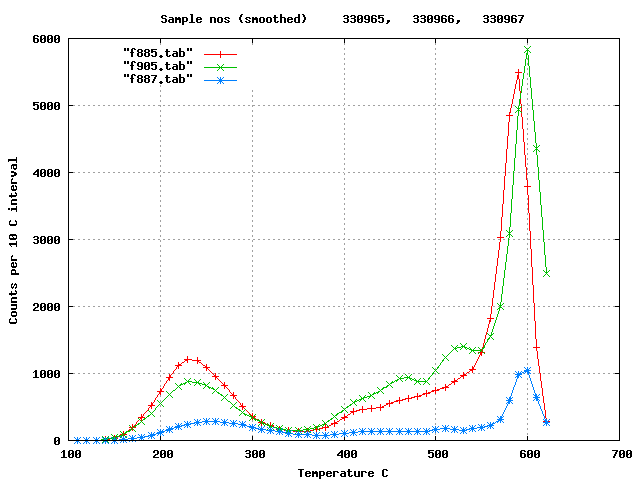 Only one of these samples (330970, blue) has substantial low temperature CO2 caused decrepitation. Samples 330971-330973 were of quartz collected from a nearby alluvial watershed, unassociated with old workings. They are presumably barren quartz and all of these lack low temperature decrepitation. 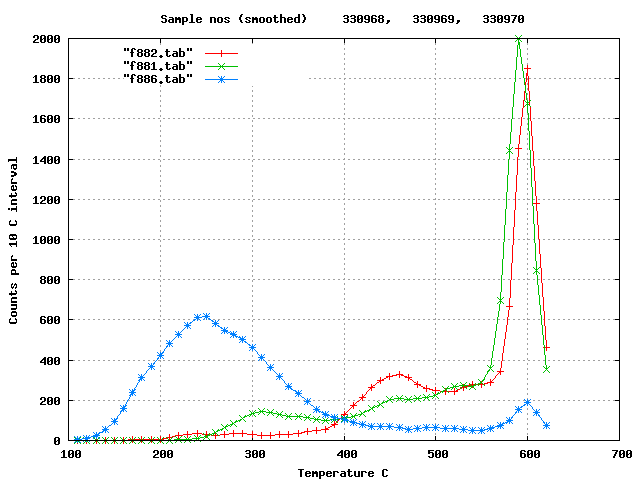 Samples 330974 & 330975 were from a small pit at the crossroads. They show essentially no decrepitation at all! Samples 330976-330978 were from small workings WNW of the crossroads. 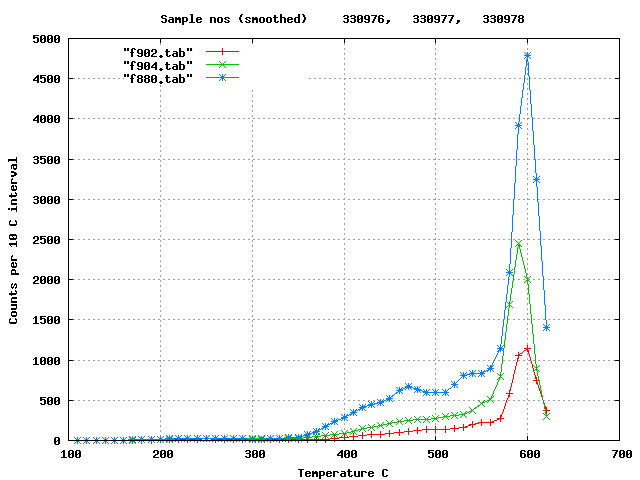 These samples do decrepitate above 400 C, but lack any low temperature decrepitation. 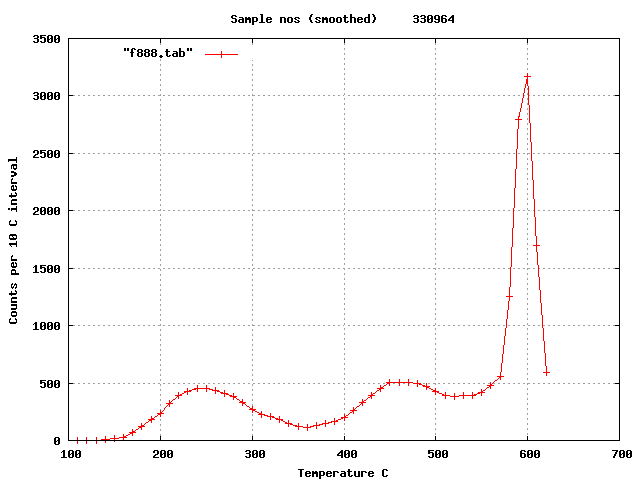 Sample 330979 was from from quartz outcrop (presumably barren) on a hilltop NW of the crossroads. It has no decrepitation at all. Samples 330980-330983 were from mullock dumps at old workings on in this same area NW of the crossroads. 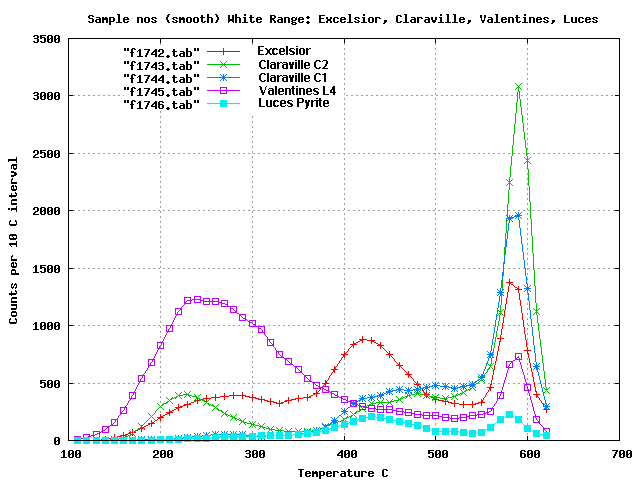 Three of these samples have low temperature decrepitation indicating the presence of CO2 rich fluids. Three of the 5 samples from the White ridge mine area have substantial low temperature decrepitation caused by CO2 rich fluids. 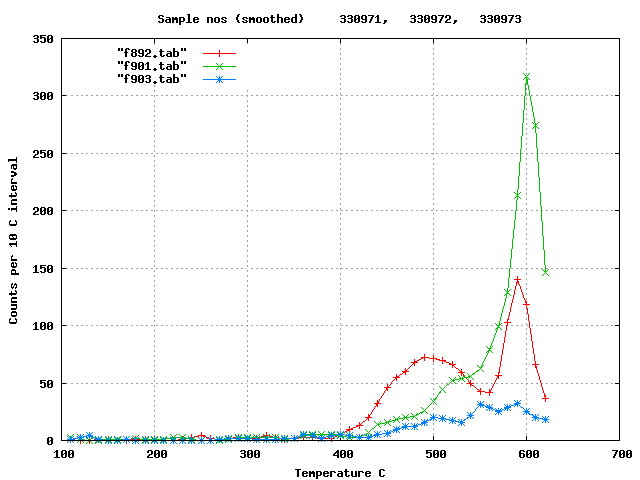 The other 2 samples have low level decrepitation at low temperatures, indicating traces of CO2 rich fluids. No gold analyses on these samples are available. However, based on the proximity to old workings, it is clear that most samples which are probably auriferous also have significant low temperature decrepitation, while most of the barren control samples lacked decrepitation at low temperatures. It is concluded that the gold in this region is strongly associated with CO2 rich fluids, which are readily detected in the quartz by the decrepitation analyses. There are multiple types of quartz in the area, which cannot be distinguished visually. These other types of quartz either lack all decrepitation, or only decrepitate at high temperatures above some 400 C. It is probable that these other quartz types are not associated with gold mineralisation, but they can be easily distinguished from potentially auriferous quartz using decrepitation analyses. Thin sections were made of 7 of the samples to visually examine the fluid inclusions. These observations will be added here.